The AAM Is Now… the AAM?! What’s all the fuss over AAM’s rebranding about? As we’ve mentioned before, it’s not as if AAM runs the museum field. No, their job is to lobby, to convince others that AAM is important. And by others we mean not only politicians and donors, but also museums and museum professionals. 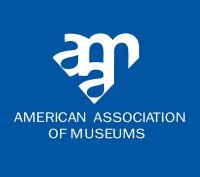 Which is why they had to change from the American ASSOCIATION of Museums to the American ALLIANCE of Museums. You don’t need to read George Orwell’s “Politics and the English Language” or watch George Carlin to understand why Ford Bell is excited about the change: the new word makes the organization sound assertive, aggressive, and powerful, things it wasn’t as an association. And by selecting “alliance” instead of the equally popular “federation” they will save money on URLs. …to this logo, which is an internationally recognizable symbol for museums. 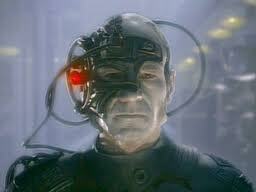 The more honest, “You will be assimilated. We will add your distinctiveness to our own. Resistance is futile.” didn’t fit on a bumper sticker. Along with a new tag line, the Alliance has two new directives: champion the cause of museums (lobby) and nurture excellence (create a measurable bureaucracy to make it easier to “champion” for museums). Thankfully someone is championing museums, because we aren’t doing a very good job of it ourselves. Despite a few notable exceptions and our best intentions, museums are by nature reactive, not proactive, cultural organizations. Since we’re usually not the movers and shakers, we’re also not the first in funders’ hearts or minds. AAM tries to overcome that for all of us, even if often feels like they’re only helping the big museums. As stated, the Alliance is also going to start nurturing excellence, which is how they describe making it faster and easier to fill out the paperwork to achieve accreditation and win the public acclaim and bragging rights that go with it. To do this they are asking each member institution to take the pledge of excellence. The pledge is the museum’s promise to try to live up to the goals set by the Alliance. 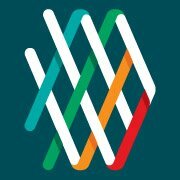 The benefit of taking the pledge is that it provides the Alliance with a list of participating museums they can use to show that they are the field’s rightful lobbyist. It’s not to say that what the Association offered and the Alliance hopes to offer isn’t of value. That’s not in question. What is in question is the Alliance’s ability to represent and guide the museum field as effectively as they advertise. After all, museums are really nothing more than independent city-states, each with their own developmental issues and internal challenges, who strive to match the field’s best practices according to their finances, professional dedication, or personal whim. Before they can hope to overcome those challenges AAM first needs to lobby us for our membership and allegiance. All of this leaves us with several questions: Is the Alliance fundamentally different than the Association? Why are we letting the lobbyists set the field’s goals? And does the Alliance have a rebel base? By the way, it would be cool if they did. This entry was posted on Tuesday, September 11th, 2012 at 6:00 am	and tagged with Administration, Museums, Original and posted in Humor. You can follow any responses to this entry through the RSS 2.0 feed. Cheeky! But very well-written and thought provoking as I have been pondering a lot of the same things in terms of preservation. The “so-what” and the “why” questions lie at the heart of this need to make others see it is important but this is where we often fall short and end up back at “um, because it’s cool?” Now if only there were an alliance for that…oh wait….